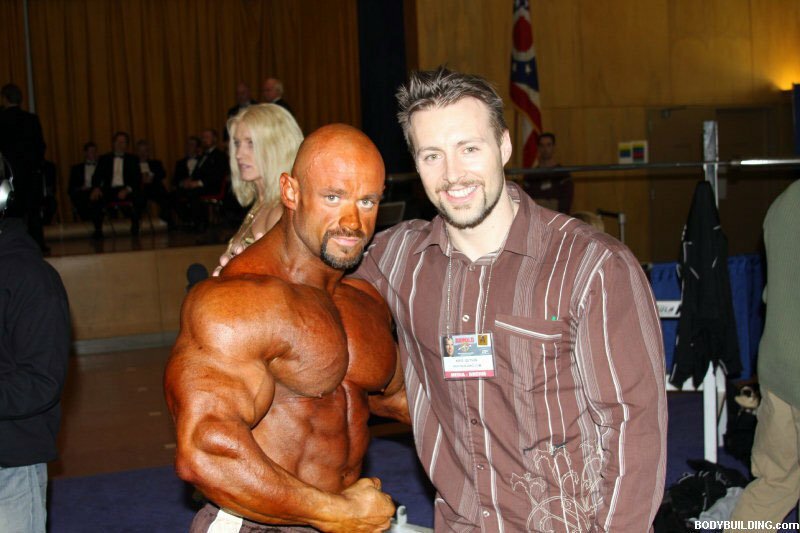 Mark Mason's Reflections On The 2008 Arnold Classic! 2008 was my fifth year attending the Arnold Classic. Each year I swear I will never go back. That feeling lasts for about two weeks and then I can't wait for the first weekend of March to roll around so I can spend some time in chilly Columbus. Well, Columbus was cold and beautiful, the crowds' larger then last year and I had the best time ever. It is so great to packed in with so many different people from so many parts the world. Wandering from event to event taking in all the athletes participating in the sport of their passion was thrilling. Watching the little kids doing gymnastics in the packed room filled with coaches, parents and other spectators was awe-inspiring. 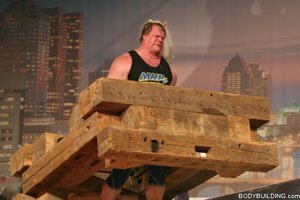 I considered Olympic weightlifting a thing of the past. Not at the Arnold. There were lifts going on the whole weekend. Be it archery, arm wrestling, fencing, or table tennis. Name your sport and you are likely to find it at the Arnold. The bottom line is everyone should make at least one pilgrimage to the Arnold. I guarantee you'll go twice. View More Pics From The Strongman Competition Here. The Expo is getting more outrageous every year. It is like a twenty-first century circus. There is something new and exciting with every turn of the head. Just ambling up and down the isles all day is a workout in itself. It is a people watchers paradise. The Bodybuilding.com Booth At The Expo. View More Pics From The Expo Here. This year I had the opportunity to cover several of the bodybuilding events and the MMA fights for Bodybuilding.com. It was a chance to see the extravaganza from a whole new perspective. 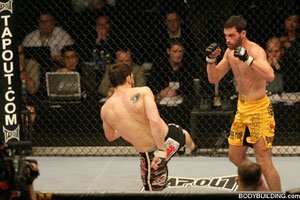 Chris Wilson Vs. Jon Fitch At UFC 82. 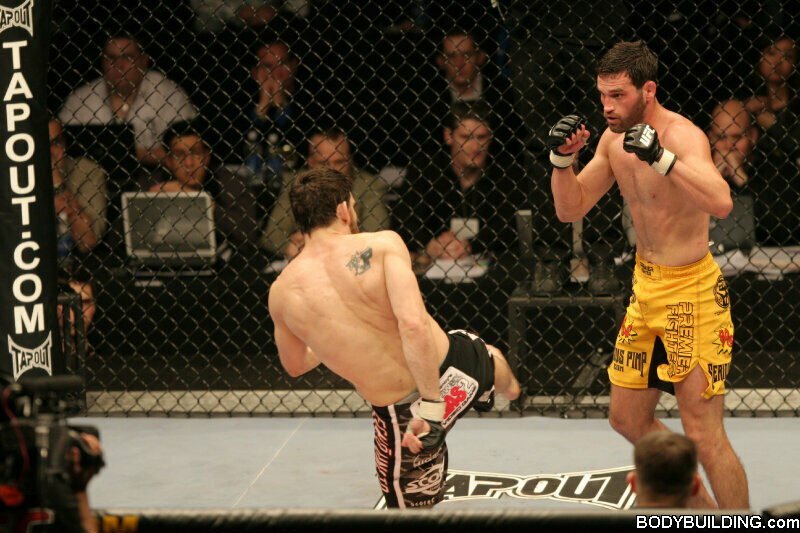 View More Pics From UFC 82 Here. Thursday evening I photographed the figure and fitness prejudging and Friday morning the men and women bodybuilding prejudging at Arnold Amateur Championships. It was great to get backstage and meet competitors from so many different countries. Each and every one of them had the love of sport and spirit of competition in common. Men & Women's Amateur Prejudging. Watch The prejudging for the amatuer competitors. Friday evening I attended the IFBB Women's Pro Bodybuilding, Fitness and Figure championships at the Veteran's Memorial Auditorium. The auditorium was just the right size to see the intensity on the competitor's faces as they battled for the top prize. Saturday morning I covered the amateur finals in the Expo and later that day the strongman competition. The rest of the afternoon was spent milling around the Expo chatting with vendors, picking up bags of free supplements and talking to pros from all facets of the industry. That evening I was in the pump room at the IFBB Men's Pro bodybuilding show. I had a chance to photograph all the competitors up close and personal. As a special treat I met all of past Arnold Classic and Ms. International winners who were on-hand to receive a special recognition award. Backstage In The Pump Up Room. View More Backstage Pics Here. And for the grand finale it was the best seat in the house at the Nationwide Arena for a half dozen of the best MMA fights I have seen in recent memory. I spent a few hours at the after show parties and then hopped the early flight back to Seattle. All that packed into one weekend. Not even a week has passed and I am already counting down for the 2009 Arnold Sports Festival.